From the Archives & Special Collections: Happy Halloween! Happy Halloween, Loggers! 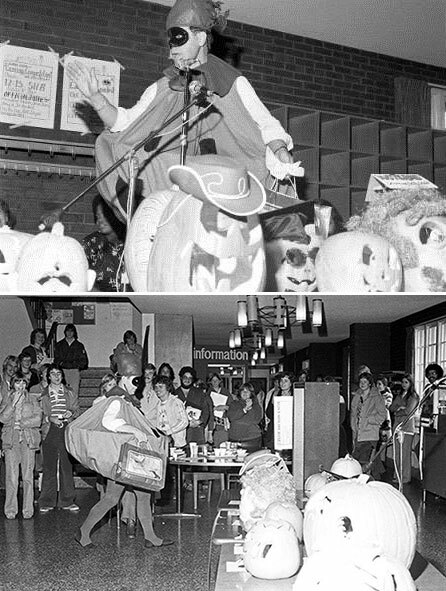 We’re sure everyone is very excited to see President Crawford’s costume at the campus Halloween party in the Rotunda today, so in honor of our current president’s favorite holiday, we’re looking back at another president’s Halloween celebration – President Phil Phibbs in 1978. In honor of the holiday, the university’s Tour and Travel Committee sponsored a pumpkin carving contest judged by President Phibbs dressed as the Great Pumpkin. According to the November 3rd issue of The Trail, the SUB was packed with competitors and onlookers. President Phibbs gave a short speech, presented Academic Dean Tom Davis with a security blanket, and threw candy to the crowd. The Learning Skills Center, the predecessor to the Center for Writing, Learning, and Teaching, won the contest with their pumpkin entitled “Mid-terms”.